"Your'e just not wearing enough flair." Let me just say I think there should be more flair for a Mason's Lady. My husband has a whole lot of it. Any time he travels to another lodge or goes down to Grand Lodge sessions, he comes home with more and more pins. He's got regular Square and Compass ones, he has Forget-Me-Nots, he has lodge-specific pins that have been designed with great care and thought. Many of them are displayed in a handsome glass case, hung in his office so every visitor there can see. Some are always affixed to his work shirts, letting others know he is a Mason. Or maybe it's a reminder to himself when he looks in the mirror. Either way, it's effective. 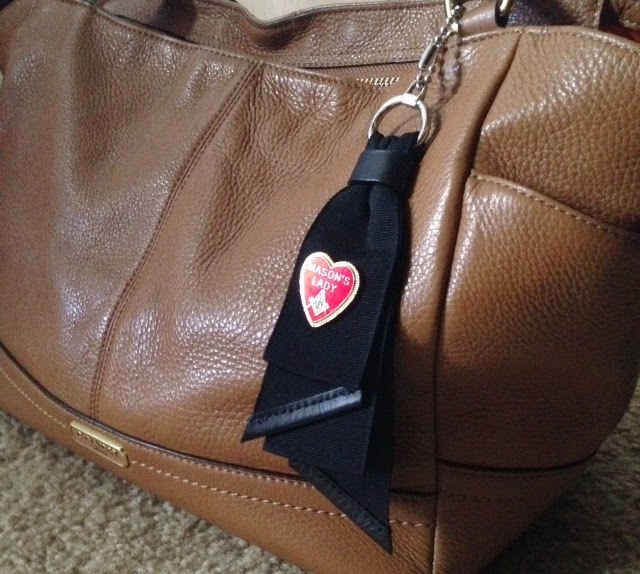 I have a small pin that is attached to a ribbon on my purse. It's a red enamel heart that has the square and compass in the middle and "MASON'S LADY" above it. I've been trying for a long time to get an enamel heart decal for my car that says just that, "Mason's Lady". It's such an honor to be a member of this wonderful and loving family where, no matter where you are, you're welcome. It would be the only "advertisement" I have on my vehicle, aside from the make of it. I removed any trace of car dealership that was on it. I'm aware that there is slipper decal but what I'm looking for is the heart. It shows that my heart belongs to someone that cherishes faith, hope and charity and above all, FAMILY. That badge of honor. I'm determined to find it. And when I do, I want to get one for all of my fellow Ladies and we'll display them with pride. Lady Cori Johnson is the wife of Brother Robert Johnson. They have been married for 13 years and have three incredible sons together. She has worked behind the scenes for all of Robert's ventures whether it be editing, brain storming and now, a bit of writing. From time to time she runs the Johnson Masonic Hotel, giving Masons a place to sleep (a nice hide-a-bed with a TV in their living room) while in town. I have heard it a million times and you have too. In fact, you may have spread these same stories. "Freemasonry is an organization that has an inner circle, an elite status within the order. If you don't know about it, you're just not high enough in the order." The educated will do their research and present quotes from great Masonic authors and scholars whose writings are revered and studied both inside and outside the craft which seem to back up the aforementioned claims. And the not so educated tends to repost these claims on social media, blogs and forums. Below are some examples and explanations. On to the statement. The first and foremost problem with this is that the Grand Orient of France is an unrecognized brand of the Fraternity (today). To those who do not understand this, here is the quick breakdown: It is agreed that Masonry has indeed existed from a time before we have recorded records however in 1717 a bunch of "Grand Lodges" decided to work together and formed the first United Grand Lodge. This was done as a way to have some quality control and streamline the fraternity among other things. When a new lodge wants to start, it needs a charter to do so. All Grand Lodges in the world who are "recognized" have a charter that has some root to the original 1717 pact and the formation of the United Grand Lodge of England or, the UGLE. So as before, let's look at who said this; Manly P. Hall. Hall was an extremely interesting individual. He was one of the folks who did things in a bit of a different order. Most men I know, join the Fraternity and then after a number of years find themselves wholly immersed in the study of occultism, that is, the study of the secret arts. (This does NOT mean anything Satanic, it merely means things that perhaps Plato or Aristotle studied, perhaps things like the beauty of the "Golden Ratio", etc.) Not Manly P. Hall. Hall was a deeply influential spiritualist and occultist before he became a Mason. He was born in 1901, almost the pinnacle of the spiritual revolution of society. Men like Milton Pottenger (another amazing Masonic scholar) had just written Symbology (1905 and extremely rare), a book to which many Masonic intellectuals of the day had plagiarized, including Hall . Hall became a Freemason in 1954. At this point he had already written books like The Secret Teachings of All Ages, Freemasonry of the Ancient Egyptians (1937), and Masonic Orders of Fraternity, all before being a member of our Craft. To the claims of the quote, this example is a better example and has more truth than you might think. The "Visible Society" Hall speaks of is absolutely true and is a necessary organization in order to open the mind of an initiate. This is where the Masonic Fraternity ends, in a sense. Due to the esoteric nature of the degrees, some men decide to further study what they went through. Many lodges today are putting an emphasis on Masonic education which has been somewhat lost in the many years preceding. So in those times, AMD chapters and Lodges of Research were formed. AMD is Allied Masonic Degrees and are styled as chapters which are by invitation only and are limited to 27 members. This is a society within a society, is it not? Only the scholar is invited, only those of higher mind. This is because the AMD has a mission which is to preserve certain other degrees (degrees which are no longer "Worked" except in the AMD), education and the study of our Craft and its mysteries. Members are required (usually) to write papers on all sorts of Masonic topics. There are in fact, even more organizations within our Fraternity which are invitation only as well Consider the Honorary 33rd degree (A degree for those in the utmost administration) within the AASR [Ancient Accepted Scottish Rite]. Other organizations that exist within the Fraternity which study the "mysterious arcannum arcandrum" are groups of Masons who start independent clubs and form ceremonies which are again, unrecognized. Then of course there are Masons who are 33rd degree and have started other spin off groups for esoteric study which are only open to other 33rd degree Brothers. This is a reality and why I say "The Great Half Truth". There is no regulation stating that a group of people can't start a study group which consists of members who all share something in common like AMD or 33rd degree. What they decide to study together is their business. The study of the "mysterious arcannum arcandrum" can be any number of things. It is whatever the people decide is their great truth. One final thing to consider in all this, is the biography of the gentlemen quoted. Both Hall and Mackey lived in times where the spiritual revolution was happening. The Terot, Fortune Tellers, Magick, Occult Studies and Reincarnation were all very popular. Groups like The Hermetic Order of the Golden Dawn were started by Freemasons. Mackey himself was rumored to have been a member of the Golden Dawn. Curious that his book was called "The Encyclopedia of Freemasonry AND ITS KINDRED SCIENCES". This title implies a study of the occult, and if you read it, you will see it. Another group which counts Freemasons among its members is the OTO or the Ordo Templi Orientis, which sometimes gets a bad rap because of its association with Aleister Crowley. 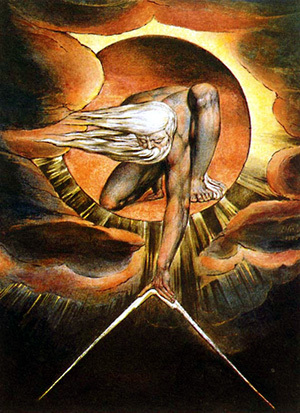 It is no surprise that Masons like Manly P. Hall and Mackey were interested in these things. 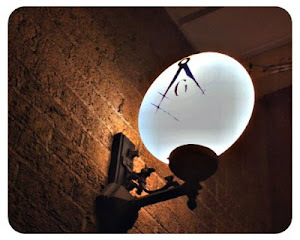 They had a personal view that Freemasonry whereas the blue lodge (The three degrees) is considered but a waiting room of sorts for members until they find out there are other groups within the craft that give them what they joined for, which is in most cases is the exoteric and esoteric discourses. It is a sign of the times. The age of Aquarius, the spiritual revolution. I would challenge anyone who still doesn't understand this to find a true member of the Fraternity living today, that is, a "Regular and Recognized" Brother of the craft, who has written a book and has the same claims which Hall and Mackey claim, and that are not saying the same thing I am saying here. For as long as I can remember, my life has been intertwined with Freemasonry. It has instilled the greatest of values in me and even shown me the secret to life. And when you finally see the “secret” for what it is, it really isn’t a secret. As in the Craft, everything is hidden in plain sight. You just need to follow the educational path into enlightenment to know what in fact you are looking at and how it relates to what you are looking for. I am not saying that I went looking for the secret of life. Not consciously, anyways. Throughout my life I have tried to follow the lessons that have been imparted upon me by the Brethren and through the rituals of this great thing of ours. I have taken to heart the lessons that we learn on our journey into the light and have made every attempt to use the working tools in an effort to refine my ashlar into the perfect building block for life. I have to say, that after what seems like a lifetime, of learning and researching, I have learned more than I ever thought was possible. But it wasn't until I had to do a project for a class I was taking that things fell into place. I had to basically write a paper that psychoanalyzed myself. It was then that I began to see the “big picture” of the life that I have led, to this point anyway. What I came away with, besides the vast array of things that I am somewhat good at, is that I have literally led a life that has been blessed at every turn. Masonry was brought into my life when I was 8 years old by virtue of my father. I strove to be like him and all the great men I met. My father was a public servant and Masonry certainly drove those qualities home in a major way at my core. I was given the abilities that made my career as a Firefighter/Paramedic easy and God granted me the humility to see it as the most rewarding career possible. Even though I have since had to retire do to a Line of Duty Injury, I came away with 4 of the greatest friends, true family, that a person could possibly hope for. Kurt & Jen have been there for me when I was on the bottom and lifted me up. There is nothing I wouldn’t do for them or their family. Then there is RJ & Cori. I may have met them through a Public Service avenue, but wouldn’t you know it, I found a Brother too. If it wasn’t for them, I wouldn’t be writing. The knowledge of what a true Master’s Wage is will blow you away when you finally earn it. There isn’t much more in this world that can make you feel apart of something more important than life itself. One thing that happened was finally finding what it means to live a life with complete Peace. I had learned to have complete tolerance and acceptance along with unconditional love. Even in the midst of having every level of trust destroyed, I was living a life of peace nonetheless. Taking a step back in time a bit, I met a young lady that I fell madly in love with 20 years ago while I was in DeMolay and she was in Job's. I know, I was 16, what did I know... Well, that is the point, I didn't. The first time I saw her I felt this connection that was just uncanny. If there ever was a definition of "Soul Mate", we were it for each other. As I look back over my 36 years, the one singular regret that I have had, was letting her go. I was moving with my parents and I let her go. I could have figured something else out, but I just let go. I have been looking for her ever since. Not "stalker" looking, but searching, just to know how she was doing. No luck for 20 years. Life happened and here I am. Wiser and worn out from these recent tribulations. Yet I still had the perspective of leading a very blessed life in complete peace… with one regret. I never would have imagined what happened next. I got a friend request on Facebook from her. We have been talking nonstop ever since. 20 years of silence feels like it was just 20 minutes and we have picked up right where we left off. And the most amazing thing, neither one of us stopped loving the other. If I was in a state of peace before, I have gone straight through tranquility and landed in serenity. It is just unbelievable to think that a few days ago I was sure that I would never find that level of love or trust again. Then she walks back into my life. Just unbelievable. I am determined to never repeat the same mistakes twice. She deserves better than me, that much is for sure, but given the opportunity, I will do everything in my power to make up for the past 20 years. I am down for whatever level of “relationship” the Supreme Architect of the Universe deems me worthy of with this special person. I am just so blessed to be able to talk to her again. Anything beyond that will certainly be by the had of God and unmeasurable in my humility for receiving such a blessing. So, looking back over 36 years, I have yet again been humbled. Everything good in my life, I owe to Freemasonry. I was given a glimpse into the eyes of an angel, even if just for a short time. I saw that there is perfection in this world, and I was blown away. Although at the time I didn’t know precisely what I was looking at. I led a life of Public Service where I was able to help and do good for so many people. I have meet so many great people that I am humbled to be able to call Brother, either by Masonry or Public Service. I also received 4 of the greatest gifts in my life and no matter how hard I try, I doubt I will be able to repay everything these people have done for me over my lifetime. There is just not enough room here to list what they have done for me or describe what they mean to me and my life. But, aside from my kids, RJ & Cori and Kurt & Jen are my Family. I would go to the ends of the Earth for Family. I suppose a little bit of disbelief is there too. How can one person be so blessed over their life? Or, perhaps we all are that blessed. We just need to be shown the way to enlightenment so that we can understand what is going on around us for what it is. Divine Providence. We are not in charge, but blessed with the opportunity to live this life. If you can do so with happiness and love in your heart, you will not be disappointed. You will see your blessings as they come, for what they are. That is the secret to life, folks. I have found it and am loving every second of my existence on a level that is just incomprehensible. I must say, I would recommend this practice to everyone, but be warned for what you may find. The truth is a powerful thing. Bro. Brian Schimian is Life of Member A.O. Fay #676 in Highland Park Illinois and the Medinah Shriners - Lake County Shrine Club. He was also the Past Master Counselor of DeMolay - Lakes Chapter in 1995. Most recently, Brian became a Companion of the York Rite, joining Waukegan Chapter #41 R.A.M. Brian is a father of two children. I attended a degree a couple weeks ago at a local Lodge, and one thing was pretty obvious to me from the beginning--the candidate knew what to expect. I don't know if anyone else noticed or not, but I could tell. And I've noticed it a time or two before. It makes me sad when I see that. In this day and age, it isn't hard to learn all the secrets of the Freemasons. In fact, it never has been. I read once that the all the secrets of the Freemasons have been known and published since about fifteen minutes after the Grand Lodge of England hung out their shingle in 1717. That's not far from the truth. And in this day and age, those secrets are readily available with a simple Google search. I'm sure many candidates today, in the Age of Information, are unable to resist the tempation of satisfying their curiousity about what to expect prior to entering the Lodge for the first time. It's a big mistake, and one you just can't undo. Going through the degrees of Freemasonry is more than just going through the ritual--it's about the experience. It's about going into an unknown situation, placing your faith in God, and your confidence and trust in men you may barely know at all. It's difficult for many men to walk into a situation without knowing what to expect, but that's an important part of it. Much of the impact of the ritual is experiencing it the first time. The best advice I have for petitioners is to really think about it before you spoil the experience. The best advice I have for those of you mentoring a new candidate is to talk about this. Discourage them from ruining for themselves what is likely to be one of the most interesting and memorable events in their lifetime. I almost spoiled it for myself when I joined the Fraternity. I was very nervous about the whole thing, and came very close to educating myself on the ritual in advance. I'm very glad I didn't. I was fortunate that somebody warned me about doing just that, and I was wise in listening to him. I was told that if I was seeking light, then I should trust my Brothers to illuminate me in the manner in which it was intended. It is something I'll never forget, and fortunately, I was able to overcome my nerves and walk into that Lodge without foreknowledge. Knowing what to expect in those degrees would have ruined the impact of the experience itself. I mean seriously, who really enjoys the movie after they've already read the book? By the Wardens and Stewards and such. That would make you lose your lunch. And Tyler Pete crashed the stairlift chair. Now that Tyler Pete he had two flat feet; he'd been there since time began. No one cares when he went through the chairs, but he was Master way back when. But he'd let you know with a tale of woe, "Dishes I don't want to do." On the Fourth of July we had cake and pie and heaps of Masonic green beans. The Lodge was well fed, "Too much food," they said, "have to take it home, it seems." They packed it all up on plates and in cups and sat it all by the door. There were many loads to get on the road, all stacked from ceiling to floor. Now that Tyler Pete with the two flat feet, was still as sharp as a tack. "Oh, I know," he said, "with his arms outspread, we'll put it all in a stack. And the stairlift chair will take it down there... It cannot fail, I swear. In no time at all, we'll get to the hall at the bottom of the stairs." So he packed it up, every plate and cup and balanced it without fear. Then he hit the switch but a little glitch made the whole load buck and veer. Well, the chair, it stopped, but the load atop, shot out like a cannon ball. The whole pile of trash dropped down with a crash, a big hot mess of a fall. At very bottom, there was a problem: it was our big plate glass door. And glass and our food on the street it spewed — cars crashed in slime and meringue. The last crash was shrill, but then it was still. The mishap stunned the whole gang. Now Old Tyler Pete said, "It's not defeat. There's a good side to it all. It may be a mess, but really we're blessed. Let's try not to be appalled. It's really a boon, as you will see soon. The good side of this shines through. I'm happy you see and soon you will be: the dishes we don't have to do." There is nothing more moving than the playing of our National Anthem - The Star-Spangled Banner. This song was written on September 14, 1814 by Brother Francis Scott Key. Key was a member of Concordia Lodge No. 13 in Maryland. The United States was at war with Great Britain in the War of 1812. The British had attacked Fort McHenry during the night and when daylight broke, Brother Key saw the large American flag still flying over Ft. McHenry that inspired him to pen the famous words in the form of poem. The poem was later developed into lyrics that were set to a song written by John Stafford Smith of England. The flag that inspired these famous words now hangs in the National Museum of American History, a part of the Smithsonian Institute. 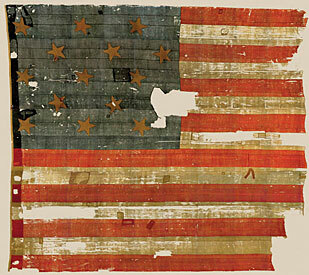 The flag was made by Mary Pickersgill (1776-1857) who was contracted to sew two flags for Fort McHenry. The famous flag was a 30 x 42 foot garrison flag. I visited Ft. McHenry a few years back and it was awe inspiring to see the spot where this flag flew. A replica of the flag still waves there today. On March 3, 1931 President Herbert Hoover signed a law making the “The Star-Spangled Banner” was adopted as the national of the United States of America. Of course we as Masons hold a special place for the flag in our lodges. Every proper lodge meeting begins with reciting of the Pledge of Allegiance to flag of our country. The next time you say this pledge think of Francis Scott Key seeing this magnificent symbol flying in the distance, representing that our country and more importantly our freedoms were still intact. Our song is 200 years old and may it inspire future generations for at least 200 years or more. I found a small booklet recently entitled “Ritual of the Sovereigns of Industry”. This booklet had a ritual for initiation of persons who became members of the Sovereigns of Industry (SOI). But exactly who were the Sovereigns of Industry? In my research I found that the group was founded in 1874 and was inspired by the The National Grange of Patrons of Husbandry and had its origins in Massachusetts when Dudley W. Adams, National Master of the Grange in 1873 asked his old friend William H. Earle to organize the Grange in Massachusetts. There was a great deal of agriculture in Massachusetts, however the state was more heavily focused on industry and manufacturing. Earle saw the potential to create an organization to unite American Workers and formed the Sovereigns of Industry as a labor reform organization. The SOI had a much different approach to solving problems than the labor unions that were forming about the same time. The SOI approach was described as cooperative instead of confrontational. They were in some aspects the forerunner of the modern cooperatives in bringing their collective purchasing power together. But as organized labor gained strength during this period, they did not like the means used by the Sovereigns of Industry. Instead of cooperation, the unions utilized the confrontational methods (i.e. labor strikes) as method to improve their working conditions. Unlike the Grange, The Sovereigns of Industry didn’t survive long. Their membership peaked at 27,984 in 19875 and they were out of existence by 1880. My friend William J. Hussey told me a story last October about a friend of his that wore so many Masonic pins on his jacket you couldn't even see his lapels--he even wore them across the back of his collar. One day, he was walking by the pool at his hotel on his way to a meeting, slipped, and fell in. Fortunately, he was able to slip out of his jacket before the weight of the lapel pins took him down to a watery grave. But the jacket was so heavy, they couldn't retrieve it from the bottom of the pool. They finally got it up, but only after they brought in the big crane from the scrap yard--the one with the giant magnet they used to lift old cars into the crusher. Now Bill Hussey might be the Grand High Priest of the Illinois Royal Arch, but I've known him for a long time. Let's just say I have good reason to question one or two points in his version of the story. I've never met his friend, but according to Bill Hussey, he's easy to pick out of a crowd--he's the guy with all the rusty pins on his lapels. Like I said--not sure about this story at all. But one thing is true--Masons love lapel pins more than any other group in existence today (the American Legion running a close second). Grand Masters make them up and hand them out to commemorate their term. Lodges make them up to celebrate special events and anniversaries. There are appendant body pins. There are officer pins. There are Past Master pins. There are pins given as service awards. There are pins only given out to Masons that have achieved a certain honor. There are anniversary pins that celebrate the number of years a man has been a Mason--when I was Master of my Lodge I awarded one of those to a 70-year Master Mason! There are lady pins for our wives. There are pins you receive when you give blood at a Masonic Blood Drive. There are pins we give to Masonic widows. There are pins worn by Master Masons that served in the military. Often the most unique and beautiful pins are ones commissioned and sold to raise money for a specific causes like the Shriners Hospitals or the Scottish Rite Learning Centers. One of my personal favorites is my Midnight Freemasons pin. Brother Robert Johnson had lapel pins made for the original contributors of this blog. Pins come in all sizes, shapes, colors, designs, and metals. Some are very expensive because they are made from gold, silver or platinum, but the vast majority of pins aren't worth more than a few dollars. 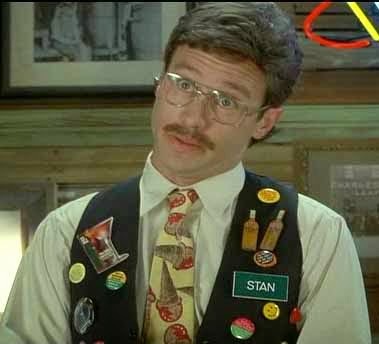 And one thing all the Masons I know have in common is they all own a bunch of pins. And I don't know any Masons that don't wear at least one of these Masonic pins on their jacket lapels. And many Masons collect them. 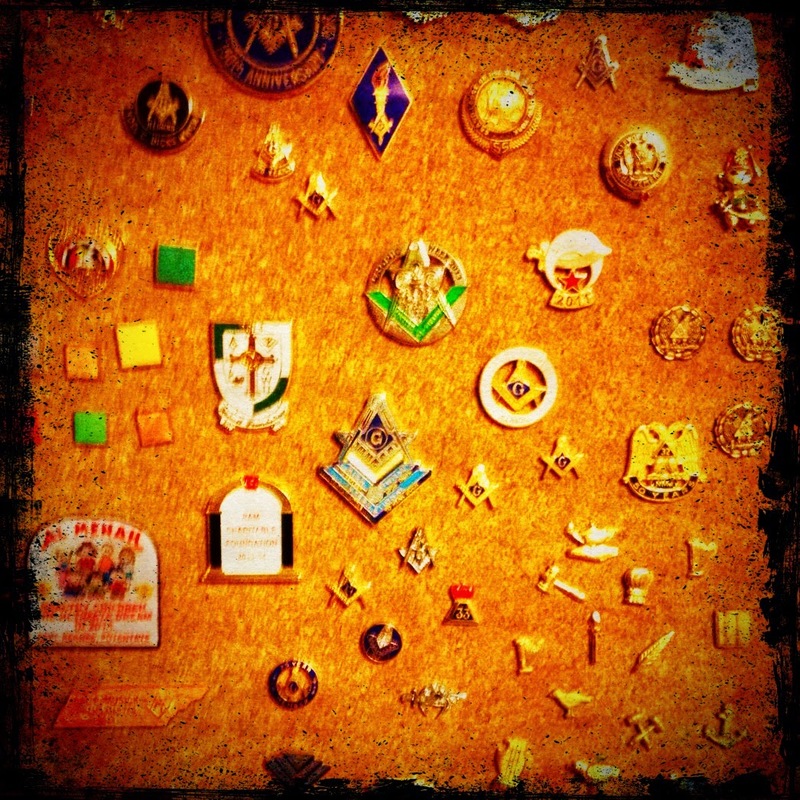 I've collected so many over the years I started sticking them in a piece of cork board on my office wall--makes it easy to select new pins when it is time to freshen up the jacket lapels. Some Masons only wear one, some a few, and others, like Bill Hussey's friend, wear as many pins as they have room on their lapels to display. And before I start the same kind of controversy and discussion as Brian Schimian and I started with our piece about Masonic rings (points up or points down?) let me quickly say I believe how many pins you wear on your lapels is purely a matter of personal taste! And Masons share pins. Greg Knott and I (Greg is also a Midnight Freemasons contributor) joined the Tall Cedars of Lebanon recently in Indianapolis. We had a great time, and afterwards, we received pins, and pins, and pins. One of the members there was friends with the current Grand Master of Tennessee, so Greg and I both have the Grand Master of Tennessee's pin--not many Illinois Masons have that particular pin. 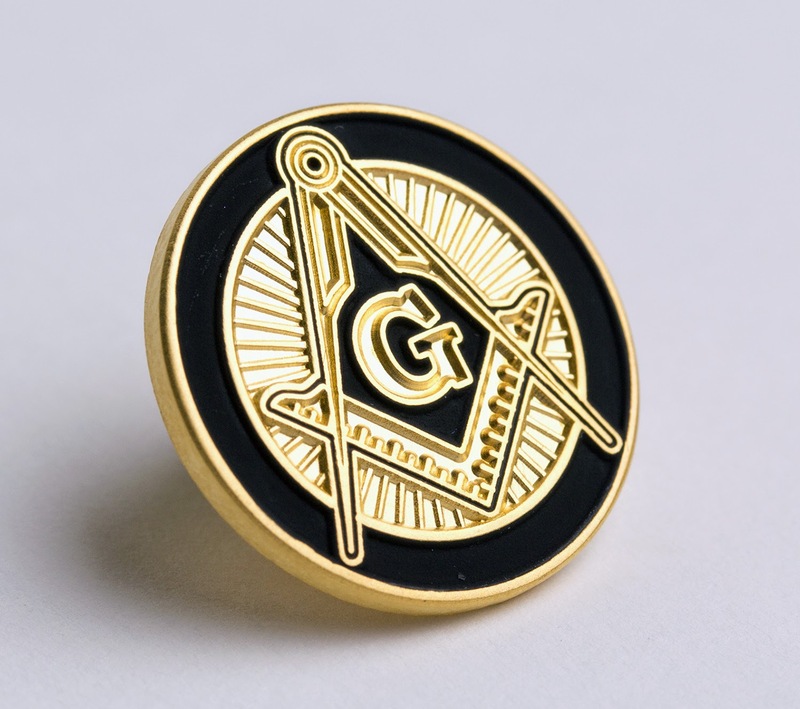 I know a lot of Masons that when they find an interesting pin, they don't buy just one--they buy two. They keep one, and they save one to give to a friend. I enjoy doing that, too. And there are special pins. I remember helping a group of Scottish Rite Masons turn a costume room upside down one time looking for a pin that had been lost. It was a pin that had belonged to the Mason's dad, and had been given to him when he was raised a Master Mason. We finally found it, too. It was stuck in the sole of one of our shoes. It wasn't gold or silver or platinum. It wasn't worth much at all. Just a pin like you can buy any day of the week for $5 from the J.P. Luther catalogue. But he was certainly very relieved to have it back. The value of a thing isn't always what it's worth intrinsically, it's what it means to the man who proudly wears it. I don't know exactly when Masonic pins came into fashion amongst Masons--probably about the time pocket watches went out along with Masonic watch chain fobs. But I do know it's a time honored part of a Mason's "uniform" along with the ring. And even the best collector in the world will ever own one of each. I've said it many times before, but for a secret society, we sure don't do a very good job at the "secret" part when we wear so much information about our Masonic affiliations right on the lapels of our jackets. "What could be more Necessary?" In our Craft much has been said about why member numbers are declining. I won't rehash the discussions here, or even the solutions that have been offered. What I offer is a response to the idea that Freemasonry is no longer necessary. But I ask what could be more necessary? It's been said that today's modern young men no longer find ideals such as honor, respect, dignity, or integrity as necessary or even desired traits. Personally, I don't think that is correct. While it may be true that we are the instant gratification generation, and many young men aren't attracted to fraternities or clubs, I've met plenty of men who are attracted to those ideals and desire to find a place that foster them. I know I did. In fact, one of the reasons I was attracted to Freemasonry was because those ideals are deeply rooted in the ritual and teachings. I could have joined any other social or service organization out there, but I was looking for something deeper than that. I wanted something that would challenge me to be a better man. I believe that I'm not the only one in my generation looking for the same thing. To my older brothers who have been curious as to why we young guys don't seem to be joining in droves, even to the point that a few have given up on us and expect a slow death of the fraternity, I say don't give up! We are looking! We just haven't found it yet. Part of the way that you can help us find you obviously isn't petition drives or billboards. But modern technology can be a great resource to help us find you. I found my local lodge by their website and facebook page. By seeing that they were active and sharing some of the principles of masonry, I was able to discover that freemasonry was what I was looking for. However, nothing takes the place of one-on-one contact. It was me meeting several men I worked with who lived the principles of masonry, though they never once discussed being masons, that made me realize that something was different about them, something that I wanted to be. It took a few years to realize exactly what it was that was different, but eventually I begin to put the pieces together and find my way to the Craft. My only regret is that I didn't do it years ago. And with all the available information on the internet including blogs and podcasts, I realized that freemasonry isn't an old man's social club but a rich tradition that offers much to the young modern man. So in closing, is masonry relevant or even necessary in today's modern world? What could be more necessary?